Organized, recreational sports aren’t just for schoolchildren. Even in small towns, there are probably dozens of sports leagues that you could join, from conventional teams like softball and volleyball, to more adventurous ones like dodgeball or curling. As an adult, you may feel like you don’t have the time to participate, or be too intimidated to join a new group, but there are significant benefits to joining adult league sports—and getting started is easier than you think. Choose the right sport(s). There are dozens of different sports out there, but not all of them are right for you. You could use an online quiz to figure out which sport is best for you, based on your body type and interests, but it’s probably better to trust your instincts. Are there any sports you like to watch? Was there a sport you participated in when you were younger? Would you prefer something fast-paced and constantly moving or something slower and more methodical? You’ll know when you’ve found something “right” for you. Invest in the right equipment. Next, you’ll want to invest in the right equipment. Too many new athletes make the mistake of investing in cheap safety gear and equipment, or not investing at all. Your safety is important, so invest in a mouth guard, helmet, or other protective equipment you need to play, and get comfortable clothing you can easily move in. Your recreational experience depends on the equipment and clothing you’re wearing, so don’t skimp here. Find the right opportunity. Next, you’ll need to find an actual league in which you can play. Ask around your social circles to find an opportunity. You might discover that your workplace has its own sports league, or find a new posting at the gym. There are opportunities everywhere, so your job is to review each one and see what works best for you. Are there specific nights of the week you want to spend doing this? Are you trying to be competitive or laid-back? Warm up to your new conditions. Pushing yourself too hard, too soon can result in an injury that takes you out of commission for the season. 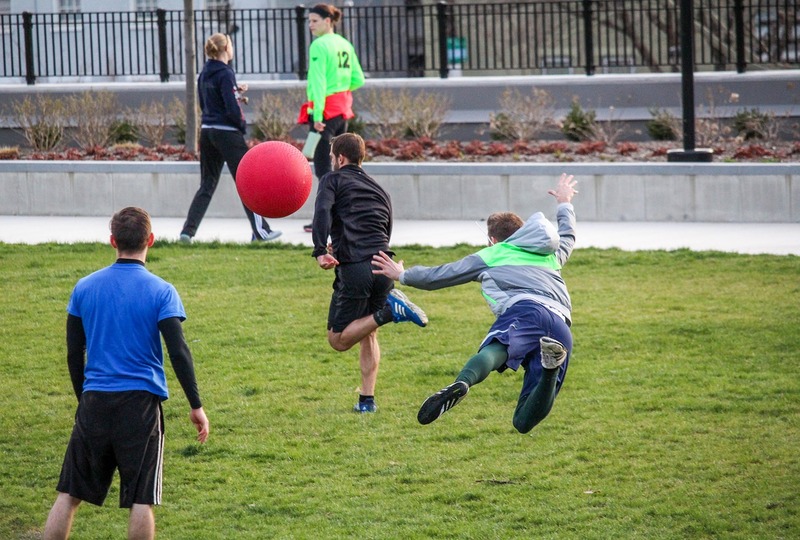 You might be excited to be a part of this new sports league, but if you don’t warm up properly, or if you push the limits of your body before you fully understand them, you could end up in serious pain. Take things slow at first, and gradually build up your athleticism. Be willing to make mistakes. If you’re new to a sport, don’t be afraid to make mistakes or look dumb in front of more experienced players. Making mistakes is often the best way to improve—if you’re willing to learn from what you’ve done. The physical and mental benefits of exercise can’t be understated. Exercising regularly will protect you from disease, keep your body in good working order, and even boost your mood and productivity. Recreational sports force you to participate at least once or twice a week, which will be a good motivation to keep yourself in shape. Even if you aren’t competitive, you’ll find a sense of personal achievement when you join an adult recreational league. You might relish in the victory you win over your rival team, or just take pride in how far you’ve come since you first joined up. Either way, you’ll feel good about yourself. It’s notoriously difficult to meet new people and make new friends as an adult, but joining a recreational sports league can help you do it. You’ll be instantly exposed to dozens of new people, all of whom share something in common with you: an interest in the game. You might find your new best friend or a romantic partner, so it’s worth a shot. Finally, competing in an adult league sport helps you learn to collaborate with other people. Whether it’s motivating each other in practice or coordinating advanced plays on the field, these teamwork skills can help you in any professional environment. Are you excited to join a new sport yet? Are you starting to feel a new sense of adventure, or a new sense of identity? Even if you’re only mildly interested in the opportunity, this could be the start of something amazing. Make time for your new sport, and start preparing for it now. You’ll thank yourself once you’re a few weeks in.